WeDigBio 2017 is officially underway in the easternmost parts of the world! How does it look from your end, Oceania and Asia??! SOCOCO! Many of you are planning on using Sococo during your event. Awesome! 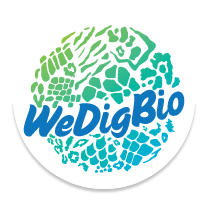 We'll be promoting events on social media and if there is a research talk, video stream, or other activity you'd like us to promote, either email us, wedigbio@gmail.com, or @WeDigBio in Twitter or Facebook. We'll update the homepage of our website with info about research talks! SciStarter! Last call to register your event on SciStarter! And FYI, it takes ~a day for them to appear online. THANKS EVERYONE! WE'RE REALLY LOOKING FORWARD TO THIS YEAR'S EVENT, SHARING ALL THE AMAZING THINGS YOU FIND IN YOUR COLLECTIONS, AND HEARING ABOUT THE INCREDIBLE EXPERIENCES SURROUNDING EVENTS! !